Fall in love with the Greek Islands at first sight - stunning sunsets, idyllic beaches, unique architecture and maybe a few insta-worthy shots for your friends and family back home - who wouldn't fall for this iconic beauty? This easygoing tour will take you through the best of the islands with plenty of time to unwind or explore. Choose your pace - get adventurous, or settle into the emerald waters and lap up the sunshine as you enjoy the whitewashed buildings and pink horizons. This 14 day package takes you to Santorini, Paros, Mykonos and Athens. Catch a high-speed ferry to Santorini where you’ll soak up stunning views and an electric nightlife; discover Cycladic architecture and stunning beaches in Paros; and see the villages of Mykonos, a world where glamour meets simplicity. After enjoying island time, head to Athens for a city highlights tour including the Acropolis and Acropolis Museum. This island hopping adventure package includes return flights, 11 nights hotel accommodation, daily buffet breakfast, high speed ferries, return airport and boat transfers, and more! 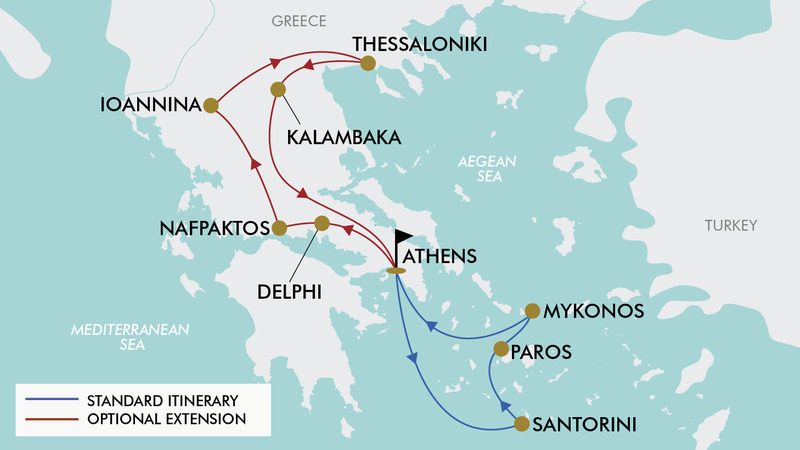 Today depart either Sydney, Melbourne, Brisbane, Adelaide or Perth for Athens! Fly with award winning Etihad Airways, Emirates, Cathay Pacific or Singapore Airlines to name a few (subject to availability). Upon arrival into Athens airport be met by a tour representative for a transfer to the hotel. On the way enjoy a short panoramic city tour. Today transfer to Piraeus Port for the high speed ferry to beautiful Santorini. Upon arrival in Santorini, transfer to the hotel, and enjoy the rest of the day at leisure. For the next two days enjoy all that spectacular Santorini has to offer - breathtaking views, stunning multi-coloured cliff faces, fantastic beaches and a vibrant nightlife. After breakfast enjoy another day at leisure in this sun kissed haven. Today transfer to the port for the high speed ferry to Paros. Upon arrival in Paros, you will be transferred to the hotel. Paros is an unassuming Greek Island in the Aegean Sea, best known for its fashionable capital, white sandy beaches, traditional rural villages and the charm of not being as crowded as its neighbours. Enjoy today at leisure and maybe do some exploring. Transfer to the port for the high speed ferry to Mykonos. Arrive in Mykonos and transfer to the hotel. Mykonos is one of the most popular and glamorous Greek isles, well known for its cosmopolitan atmosphere, whitewashed houses, beautiful beaches and nightlife. The Old Town has many shopping and dining options. With so many highlights - take today to explore the beaches and coves and indulge in the many dining options available. Be sure to try some local seafood in a traditional Taverna. Transfer to the port for the high speed ferry to Piraeus. Arrive back into Piraeus and transfer to the hotel. After breakfast enjoy an Athens Highlights city tour, including a visit to the world-famous Acropolis. The Acropolis is an ancient citadel located on a high rocky outcrop above the city of Athens containing several ancient buildings of great architectural and historic significance, the most famous being the Parthenon. Whilst here, also enjoy a visit to the new Acropolis Museum. After breakfast a transfer will be arranged to the airport for your return flight back to Australia. *Please note, some flights may arrive in Australia +1 day later. After breakfast you will travel northwest passing through the cosmopolitan village of Arachova as you continue towards Delphi. Delphi is considered the navel (omphalos) of the ancient world. On the slopes of Mount Parnassus, in a landscape of unparalleled beauty and majesty, lie the ruins of the Sanctuary of Apollo Pithios. Visit the site and the museum where you will see the archaeological treasures such as the unique bronze statue of the Charioteer. Afterwards, continue on to the seaside town of Nafpaktos. Upon arrival, check-in to the hotel and then enjoy an early evening walk with the tour manager. Today depart from Nafpaktos and enjoy a scenic drive towards Ioannina, passing through the towns of Amfilochia and Arta. Ioannina, the capital of Epirus region, spreads out around beautiful Lake Pamvotida– the area’s trademark. Enjoy a stroll around the historical city centre and view the castle and the Fethiye Mosque. There will be opportunity to take an optional tour this afternoon (not included) on a lake boat and visit the islet within the lake to admire some beautiful monasteries and taste some local delicacies, such as frog’s legs. This morning, the tour will continue as you drive northeast passing through the picturesque villages of Metsovo, Kozani and Veria on the way to Thessaloniki; the 2nd biggest city in Greece and so-called “the Capital of the North”. Upon arrival, enjoy a city tour taking in the main attractions in the city. From the White Tower and several Byzantine churches to the Kastro of Ano Poli, Aristotelous Square and the impressive seaside promenade of the city. Today the tour heads south towards Kalambaka to marvel the supernatural mix of natural landscape and human-made constructions. Meteora is not only a unique witness of monastic life and art in Greece, but also an incredible place to mesmerize at amazing views, green valleys and steep rock formations that will leave you breathless. On arrival, check into the hotel and in the afternoon enjoy a visit to the Grand Meteoron monastery, the biggest and oldest of all, founded by Saint Athanasios the Meteorite. This morning after breakfast begin the journey to Athens. On the way stop for a photo at Thermopylae where Leonidas, the 300 Spartans and additional 800 Greens defended the land in 480 BC against the Persian Empire. Upon arrival check in to the hotel and enjoy the remainder of the day at leisure. Travel offer is valid for travel on selected dates until the 21st October 2020. Itinerary 1 (14 Day Package): $999 per person. Itinerary 2 (19 Day Package): $1399 per person. Please note: dates/months with an * incur a high season surcharge. *Land High Season Surcharge: $350 per person. Qatar Airways, Etihad Airways, Emirates, British Airways, Singapore Airlines, Cathay Pacific, Virgin Atlantic, Royal Brunei, Lufthansa, Swiss Airways, Austrian Airlines, Scandinavian Airlines, Air France, KLM, Finnair, Virgin Australia, Thai Airways, Korean Airlines, Malaysia Airlines, China Southern Airlines, China Eastern Airlines, Turkish Airlines, Oman Air, Garuda Indonesia, Vietnam Airlines, Air China, China Airlines, Malindo Airlines plus codeshare partners (subject to availability). - Only an outbound OR inbound stopover may be chosen for Doha; not both. - Business Class: Buy now $5999 per person. - Athens, Greece (Pre/Post Tour): $180 per room including breakfast. - Valid for Children/infants 8 years old and over. Minimum group size 20, maximum group size 28 per vehicle. Please note: the 19 Day extension package, has a minimum group size of 10. - Visa fees and requirements (A visa is not required for stays up to 90 days for Europe if travelling on an Australian passport). - Meals/beverages not stated in the itinerary . Recommended at €5 per person (approx. $8 AUD) per person per day (Athens tour and pre-extension tour) payable direct to the tour leader. * Accommodation Tax: 4 star hotels: €3 (approx. $5 AUD) / 3 star hotels €1.50 (approx. $3 AUD) per room per night (payable at check in at each hotel directly). The Greek Ministries of Tourism & Finance have introduced an Accommodation Tax at the sum of €0.50 - €4 (approx. $0.80 - $6 AUD) per room per night with effect from 1st January 2018. This Tourism Tax will apply no matter if the booking was made before or after the announcement. Please take note that the tax will be collected directly from the accommodation establishment upon check in. The best time to visit Athens and the Greek Islands begins in May, when the mean temperature is 21 °C degrees and rainfall is minimal and continues on through to October with average temperatures ranging from 21-29 °C. Days are sunny and clear! Gratuities (tips) are not included in the tour price for services of the tour leader (when available) and driver throughout the tour. The recommended tip for the tour manager and driver is €5 (approx. $8 AUD) per person per day (Athens day tour and pre-extension tour), which will be collected by the tour manager whilst on tour. For the Greek Islands portion of the tour tipping is discretionary. A tourist visa is not required for Europe for stays up to 90 days if travelling on an Australia passport. Important: Please start arranging your visa at least 3 weeks prior to departure to account for any delays due to consulate operating hours. • 1st Change - $100.00 per person + any additional charges applied by the airline/cruise company/accommodation/other travel provider. • 2nd Change - $150.00 per person + any additional charges applied by the airline/cruise company/accommodation/other travel provider. • Subsequent changes - $250.00 per person + any additional charges applied by the airline/cruise company/accommodation/other travel provider. • Changes within 30 days of departure $350.00 person + any additional charges applied by the airline/cruise company/accommodation/other travel provider. • Changes within 14 days of departure $500.00 per person + any additional charges applied by the airline/cruise company/accommodation/other travel provider. • If the incorrect name has been advised to TripADeal, charges of $150.00 per person + any additional charges applied by the airline/cruise company/accommodation/other travel provider.